Albizia julibrissin is a fast growing tree, up to 3 feet or more per year. The Mimosa can grow to 25 feet tall and at least twice that width. The Mimosa is a great deciduous shade tree. The soft finely divided leaves and silky pink flowers are beautiful. But there are some things to plan for. The Albizia julibrissin trees drop a tremendous amount of debris during the late Spring as the flowers drop and in the fall when the leaves come down. Albizia julibrissin is similar in appearance to the Jacaranda trees until the flowers come on. There is a dark burgundy cultivar called Albizia Summer Chocolate. Albizia julibrissin trees are hardy to zone 6. Injured or diseased trees will often come back for another season even when it looks like there is no possible chance. Albizia is native to Asia where there over a hundred other Albizia species. 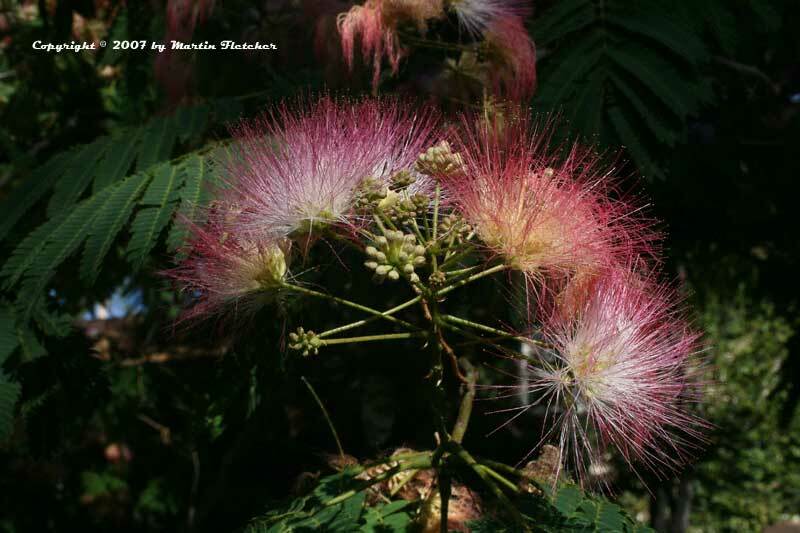 Albizia is on the pest list in Florida and produces seedlings quite frequently in the garden here. The Mimosa trees are susceptible to several fungus diseases. Easy come easy go. This is often the case with fast growing trees. Flowers and foliage of Albizia julibrissin the Mimosa or Silk Tree. High resolution photos are part of our garden image collection.